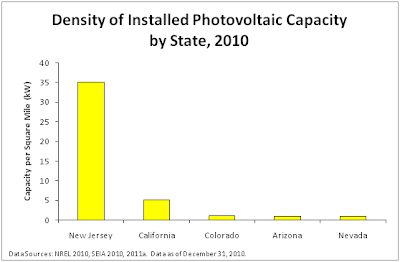 In recent years solar development has become increasingly popular in New Jersey. Probably the most visible manifestation of this is the placement of small solar panels on utility poles throughout the area served by PSE&G, the largest utility in the state, although rooftop solar panels on residential and commercial buildings are also becoming quite noticeable. This is all due to aggressive policy incentives by the state, starting about ten years ago, to encourage solar. Initially these consisted of rebates, but recently the state shifted away from providing money directly and now relies on a system of Solar Renewable Energy Certificates (SRECs), which are tradable credits that utilities can use to meet their requirements under the state’s Renewable Portfolio Standard (RPS), which mandates a certain percentage of electricity generation in the state has to come from renewable sources each year, with a specified level of that specifically from solar. SRECs are generated by all solar installations registered with the state and traded freely, which provides a major incentive for the development of solar. At current SREC prices, the income stream from SRECs vastly outweighs the income stream from the electricity generated by solar installations. 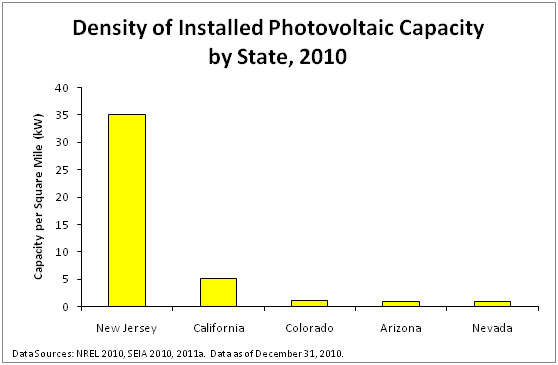 As a result of these incentives, solar development has been booming, and New Jersey now has more installed solar capacity than any state except California. Due to its much smaller land area, however, the amount of installed capacity per square mile is the highest by far of any state. 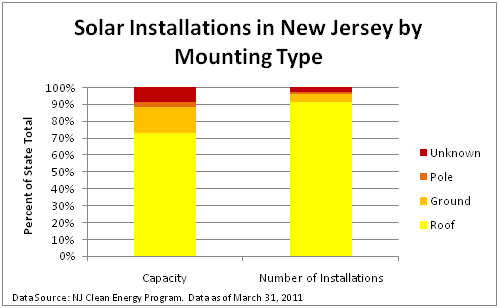 As of April 29, New Jersey had 9,032 solar projects with a total capacity of 321 megawatts. For comparison, a typical coal plant is 500 megawatts, and the Hope Creek Nuclear Plant has a capacity of 1,268 megawatts. Solar is thus still a very small proportion of the overall electricity generation in the state, but it has been growing rapidly. 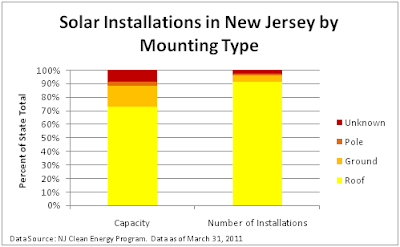 This is a concern for land-use planning, because solar can be relatively land-intensive compared to other electricity generation options, and New Jersey has relatively little remaining space compared to many other states. During this past spring semester, I worked on a project as an intern for New Jersey Future to evaluate the state of solar development and its implications for land use (the results are summarized on their website here). What I found was that despite a lot of recent concern over some high-profile projects in South Jersey which would use a lot of land for utility-scale solar generation, the vast majority of solar development so far has been in the form of small rooftop systems that use no additional land and are quite compatible with Smart Growth principles. As of March 31, 91% of installed systems with available data were mounted on rooftops, and only 5% were ground-mounted. Since ground-mounted installations tend to be larger, they account for a larger proportion of total capacity (15%), but rooftopo systems still account for 73% of installed capacity. The main concern going forward will be to ensure that this pattern continues; there are plenty of rooftops left, and no pressing need at this point to turn to large, ground-mounted systems that use up precious land to meet the state’s goals for solar, ambitious though they are. Solar cells have been used to power calculators, outdoor light fixtures, street lights, satellites, water heating systems, air conditioners and heaters.